Android doesn’t need any introduction, now everyone is carrying an Android device with them. It’s beautiful interface, tons of apps and crazy games made us Android fans. Wished to play your favorite Android game on the big screen or on your PC. Oh! big screen tablets are available there, I know, but want to play it on your Windows PC. Don’t want to run a dual boot on your PC, then this topic is for you. Here we are looking into some of the best methods to install and run all your favorite apps on your Windows PC, without altering your PC’s configuration. Do you want to play Angry birds or Pokémon GO (an augmented reality game) on your PC? You can use Android emulators to make your PC look like an Android device. There are several methods that you can adapt to make your PC Android apps friendly. This is the first app we are going to mention, as it is free and contains feature-rich Android app code editor and emulator. The Android studio has an inbuilt Emulator which installs and starts the apps faster than an actual device. The emulator can also use the apps to test its usage on various Android device configurations like phones, tablets, Android Wear, and Android TV devices.The hardware features such as GPS location, network latency, motion sensors, and multi-touch input are also supported. You can download the Android studio bundle having a size of nearly 700MB from Android developer website. BlueStacks app player is an android simulator working on the PC or Mac. You can play many games on this emulator. You can check their website to see the list of games available and supported by the app. They have a big list of a collection of available apps and sorted it using filters like, weekly top, monthly top, etc. You can check Bluestack’s blog to know how to install and run popular apps, as they gave a detailed description of how to install and run different games. You can see this Bluestack video to know how to install Bluestack on your PC. This is a popular Android emulator from the popular bios software manufacturer American Megatrends. Amiduos helps the easy switching between Windows and Android environments without installing the Android as dual boot. AMIDUOS offers full Android experience, with all the features on the latest version of the Android operating system. It runs fast, looks crisp and sharp and performs with no limitations like a native Android running on your Windows hardware. Thanks to AMIDuOS 3D acceleration, you can enjoy better Android gaming experience in Windows PC. This app uses Windows OpenGL drivers for improved frame rates to support even the most graphics-intensive games. In this app, the applications run mainly in the native x86-mode to provide peak performance, while ARM emulation is only performed on an as-needed basis. This helps AMIDuOS to save power and extend battery life to the fullest. The app supports key peripherals and sensors of the Windows hardware, including high-definition cameras, audio, and microphone. Sensor support includes Ambient Light, Accelerometer, Gyrometer, Compass, and Orientation which gives you the full Android mobile experience. AMIDuOS gives complete Android tablet experience with multitouch and gesture support like Pinch and Zoom, along with a full-featured software keyboard. It also offers Compass and GPS functionality, allowing map navigation by multitouch. File sharing between Windows and Android is also supported in AMIDuOS, so you can share pictures, videos, and music between both OS modes with ease. AMIDuOS also supports SD card emulation and allows you to configure the SD card size with an easy-to-use configuration tool. You can view this nice video explains how to install Amiduos on your PC. 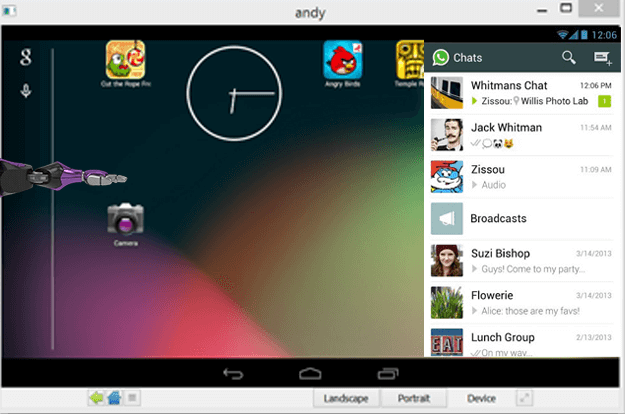 Andy is a free app, that enables us to use up to date latest Android OS features on the desktop. With Andy, you can run Android on windows and also provides users with unlimited storage capacity, PC and Mac compatibility, and the freedom to play the most popular mobile games on a desktop. You can easily run all your communication apps like snapchat, Viber, WhatsApp etc. from your desktop. The best feature is you can use your phone as a remote control when playing games. Koplayer is a free Android Emulator for pc that enables all Android games and apps to run smoothly on Windows systems. Koplayer is built on x86 Architecture, support advanced features like OpenGL & hardware acceleration, run faster, more stability and compatibility than other Android Emulators. It supports multiple accounts, video recording, gamepad, and keyboard. Droid4X (https://droid4x.en.uptodown.com/windows) is a full-featured Android emulator that you can use for anything, from video games like Clash of Clans or Subway Surfers to apps like Kitchen Stories or Tubemate. 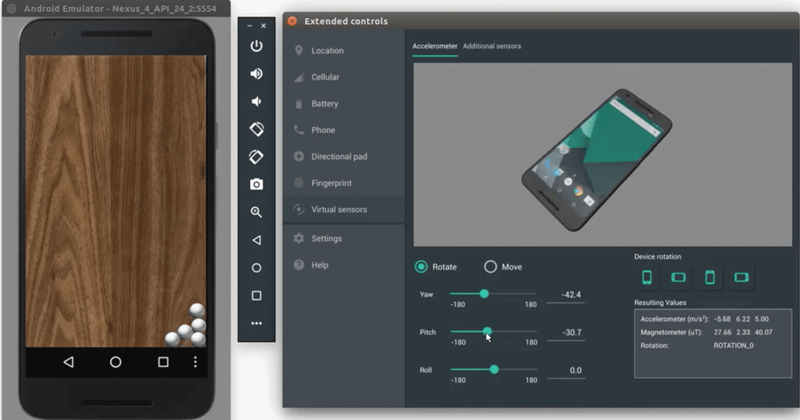 Genymotion (https://www.genymotion.com/)is more than an Android emulator, it is a powerful virtualization platform but with a price. You can use Menu player (http://www.memuplay.com) to play different games and apps on your PC. Noxplayer (https://www.bignox.com) also offers smooth gameplay on your Windows Pc. Remix os player (http://cn.jide.com/remixos-player) is also a good alternative. We are closing this discussion with Windroy. Windroy is a short form of ‘WindowsAndroid’, a project that combines the functions of YouWave and Bluestacks, and attempts to emulate Android in Windows. Its aim is to be able to run all Android apps and to be as easy to use as any other Windows application.